This Thursday evening, Twickenham Stoop will play host to a special game celebrating the 10th anniversary of the 2003 Rugby World Cup final. In a rematch of that famous game, a team of England Legends will take on a team of Australia Legends, with both sides featuring stars who took part in that famous match in Sydney. The game is also raising funds for rugby-related charities, so it’s a great night all-round. Canterbury have produced unique, one-off match shirts for both teams to wear in the game, and have kindly provided us with a shirt to give away to one lucky Rugby Shirt Watch reader. Jason Leonard, Martin Corry, Jason Robinson, Phil Vickery, Josh Lewsey and many other members of the victorious 2003 squad will take on a formidable Australian team, that includes Stirling Mortlock, Al Baxter, Chris Whitaker and Richard Harry, wearing the one-off shirts from Canterbury that you see above. No replicas of these shirts will ever be produced – they’re only being produced for the players to wear on the night, so this is an EXTREMELY rare shirt that would be a fantastic addition to any shirt aficionado’s collection. The shirts are refreshingly old-school and simple, which given that England winning that famous World Cup in 2003 started the trend for the skin-tight modern shirts that are the norm today. 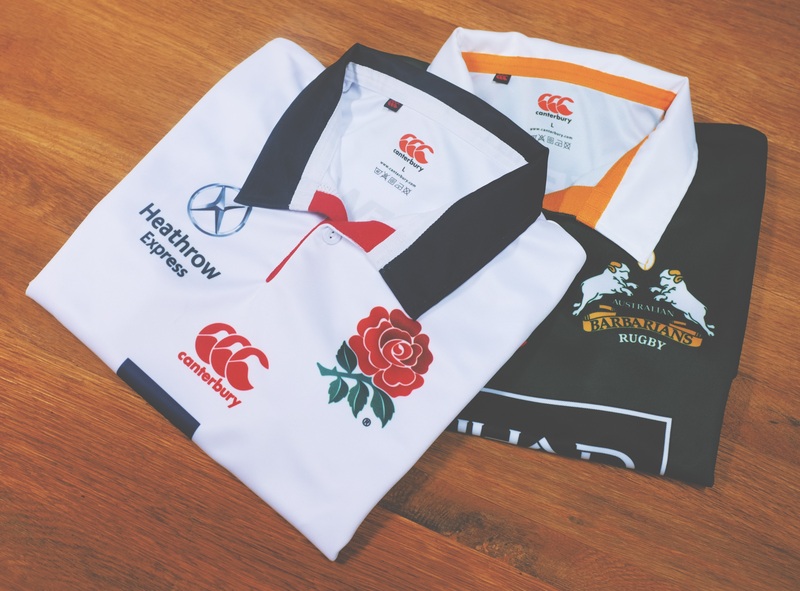 The collars are a classic turn-down style (that everyone prefers, really), with the England shirt sporting flashes of red on the sleeve – a nod to the red underarms of the 2003 shirt – while the Aussie Legends are playing in the dark green of the Australian Barbarians. The game will raise funds for two fantastic rugby-related charities – Restart and The Injured Players Foundation – so if you want to be part of what’s surely going to be a great occasion and raise money for a good cause, tickets are still available, so head on down. For more information about the RWC2003 England v Australia 10-Year Anniversary Match, head on over to the Canterbury website. This competition is now CLOSED – thanks for all your entries! Am i supposed to get a comfirmation email saying iv entered? because i havent got one, how do i know if u have recieved it? Nothing as advanced as all that Richard – rest assured be just checked and your entry has been received.